Data is the life blood of business. When data connections go down, business shuts down. Pipelines can’t pump product. Banks can’t move money. Retailers can’t make sales. Hospitals can’t access health records. Safety issues shut down plants and factories. Are Your Prepared for the Worst? Although standard communication lines are usually dependable, your business is still at risk from flood, fire, ice storms and other natural disasters. Even a corrupted server at your Internet Service Provider or a careless maneuver with a backhoe can take down your data connection – and throw your business into turmoil. But you don’t have to just accept a business shutdown when disaster strikes. You can stay up and running with a redundant communication link via satellite. Infosat will provide you with a fully functional backup system that can handle all of your data transmission requirements. During normal operations it will sit quietly in the background. But as soon as the need arises it will be instantly available, enabling you to conduct business as usual. Downtime for your business is extremely expensive. A redundant communication link from Infosat is a cost effective alternative. What Systems Do You Need to Support? What systems are essential to your business operations? What locations do you need to stay up and connected? Call us to discuss your mission critical systems. We’ll design and implement a solution for your specific needs. We look forward to learning about your specific needs and equipping you with a solid solution. Who Needs a Redundant Communication Link? Infosat witnessed firsthand the immense value of redundant communication and power systems during the worst natural disaster in Canadian history – Alberta’s devastating flood of 2013. One of our satellite hubs was struck by the deluge. Although the hub was without power for 67 days, our network incurred just 20 minutes of downtime during this unprecedented crisis. 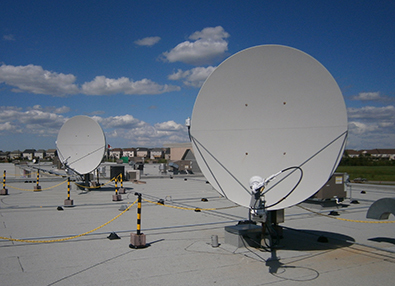 Infosat’s extreme engineering standards and redundant systems made all the difference. Let us protect your business with this same level of disaster resiliency.